This is Northern Norway in late December. Although the sun does not come up over the horizon until January, there are still a couple of hours of light every day. What light it can be! Just look at the image above. This is Rayleigh scattering at its very best. You can see these colours on the other horizon away from the sun. It is light that has quite literally travelled around the Earth and been scattered back and forth in the atmosphere. “Scatter” is a weird word? Well, physicists think so, too, but “reflection” is not a good way to describe it, and we have to call what the atmosphere does to sunlight something. “Scatter” it is. Don’t be afraid. Get used to the word and move on. …which brings me to a rather peculiar thing. 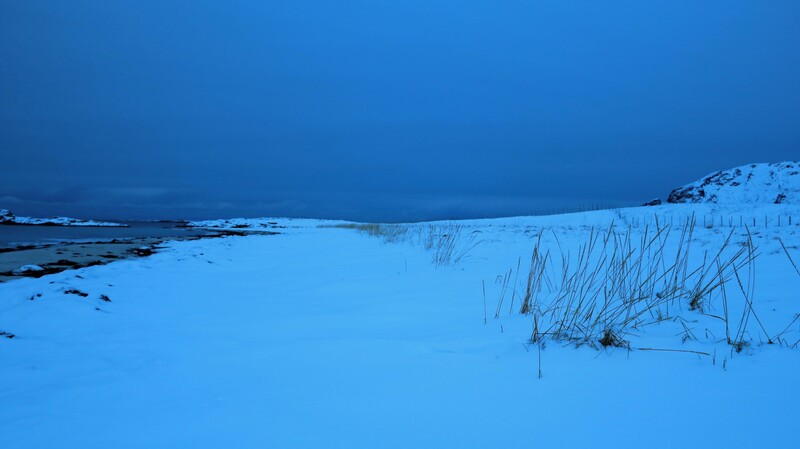 It keeps scattering physics at the forefront of people’s minds up here: The Blue Hour of the North. People in the North mostly live in small enough places for everyone to know everyone else. During the winter hours, during the polar night, that can be a blessing and a curse at the same time. See, people are exactly the way you would expect them to be when it is dark and they have not been drinking: just a tad more grumpy and tired, feeling blue and making bad decisions. The following story, in the summer, would have gone like this: I would have called someone to take me with her to work. End of storya. Then, this was winter, it was dark. Nobody, not me or the people honking behind me, made good decisions. As I entered the garage and opened the door to my Japanese hybrid vehicle, I realised that I had forgotten to charge it during the night. There was almost no petrol in the tank either. In fact, I became quite unsure as to whether there was enough petrol in the tank to get to work even. Perhaps there was a remnant of energy left in the battery. At work, I would be able to charge it at a brand new charging station. So, of course, I drove past the petrol station which was located half a kilometre from my house and on to work. I escaped the worst. I arrived at the office with what felt like more sweat on my forehead than petrol in my tank. I hate to admit it, but what I had forgotten just a few minutes earlier was that the new charging station at work was going to be installed the next day. Not on this day. I was stressed out, in meetings, talking to colleagues. During lunch, I spilled coffee on myself and that weird Norwegian ham cheese onto a co-worker. If you know ham cheese, you know, that it is not easy to spill it. It comes in a tube and has the consistency and looks of tooth paste gone bad. The longer the work day went, though, the more I became convinced that I may have just about enough electricity and petrol left in the car to actually make it home again. Don’t ask me why. Nobody asks why in winter up here. I could not wait to get home. Therefore, I tried the task. It went well until I reached about the halfway point of my five-kilometre ride home. By that time, I had realised what an idiot I had been. Did I mention that it was already dark again at 4 pm? So, I sat in my car thinking. What to do? I could just put the pedal to the metal so to speak and hope for the best. But then my car told me, urged me to get to the gas station – there was exactly one on my way home – or to a charging station – there was exactly none on my way home, or many, depending on your perspective. I got goose bumps on my skin. The nervousness was rising in me like the magma in a volcano. Did I mention that it was dark? The darkness got on my nerves, especially when it was pierced by the headlights of the people behind me. I rolled past my friend’s house and did not have the idea to stop there in order to charge. It would have been too embarrassing. My goal was the petrol station. There were quite a few cars behind me now. A lot of them were honking and tooting. I saw my boss, his uncle and a couple of guys who had married into the place’s dominating families. I saw the local food vendor and her husband in one car. She was the godmother of my boss’ grandkid. They would meet each other at work and privately, every day, every week, every month. I do admit that this unnerved me to quite a degree. But I kept rolling, at ever smaller speed, up a hill, down on the other side, around bends and swings. To tell you the truth, deep down, I knew that what made these people behind me crazy was not really the speed but the fact that they could not see enough of the road to drive past me. I simply rolled on. I turned away from the main road, stopped under the roof of the petrol station and left the car. I counted. Twenty-three cars, honking as they disappeared into town. I felt elated and received the ovation with a bow. I filled up the car and went into the building to pay. Not for the petrol. I had done that by credit card outside. No, I very nearly jived through the aisles and bought everything from bottled water to freezer fluid and a hot dog. Yes, they’d be talking about this for years. The German rolling home in a Japanese car, which could have been propelled by either petrol or electricity and was by neither. Then I realised that if I had made it to the petrol station, I could have just as well driven home those last five-hundred meters and charged there. “Whatever. I’ll do that, too.” I told the surprised cashier and left. They all have their winter stories up here anyway.